Curlies, it is that time of year again when the weather gets warmer, the days get longer and couples get hitched. These memories may be fleeting, but those photos will be forever. No lie — your future children will judge, analyze and plan out their future weddings based on the photos they find hidden in your closet from your own or your best friend’s wedding. Either way, while your own photographic perception of the beginning of this marital bliss may fade, digital cameras and social media sites will ensure that the proof you were there never will. For us curlies, it's essential that our textured tresses stay frizz free, defined and inspiration-worthy for all future curly girls looking through the photos that will end up who knows where. One of the biggest secrets to awesome natural hair is forgoing heat appliances, and I’m not just talking about your flat iron. That curling iron has to go, too. So what is the secret to romantic wedding hair that keeps your mane healthy and looking fierce throughout an entire summer ceremony? Simple — Curlformers. If you haven’t already heard about them, Curlformers are the next best thing to Shea butter or sulfate-free shampoo to enhance and change your current textured look without heat. 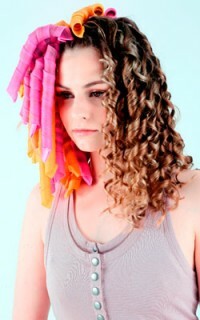 The method is perfect for wavy girls looking for more curl all the way to coily girls looking for stretched out curls. They work for all hair types and all hair lengths. Top stylist Mark Woolley shows you how to use Curlformers to get your best wedding hair yet. Apply Curlformers to damp/freshly washed hair or mist each section with a water spray as you go along. One of the many great things about Curlformers is that the “wash and set” technique used gives definition and natural hold to your curls and waves and you don’t always need to use a styling product. The choice is yours! Make sure you have put together the two parts of the Styling Hook. Then, holding the handle, feed the Curlformer on to the Styling Hook. Starting at the nape of the neck, and with the rest of your hair clipped out of the way, take a small section of hair, approximately half an inch wide. Give it a quarter turn twist and holding the handle higher than the hook, slip the twisted section into the hook. The two-minute video below will also show you how to remove your Curlformers. Apply Curlformers to your entire head of hair, or wherever you want to add texture, curls or waves. When complete, allow hair to dry either naturally or with the help of an inflatable hood dryer attachment. The time taken to dry will vary depending on the size of hair sections and the texture and thickness of your hair. Remove one Curlformer to determine whether hair is dry and re-apply if it isn’t. Do not remove until completely dry and leave in for as long as possible. As you remove the Curlformers your curls will spring back into place. You can either your fingers through for a softer curl or use a brush to loosen into waves. 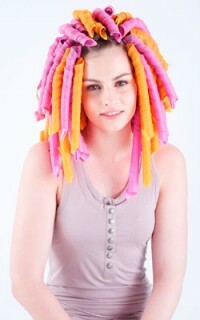 Remove Curlformers to reveal a head of soft spiral curls, then loosen with fingers to create romantic curls and waves. To recreate your wedding hair, take some of the curls away from your face and loosen, then gently brush through for soft waves, texture and volume. Don’t already have a Curlformers set of your own? Stay tuned for NaturallyCurly’s Curlformers giveaway in May and win a free set!